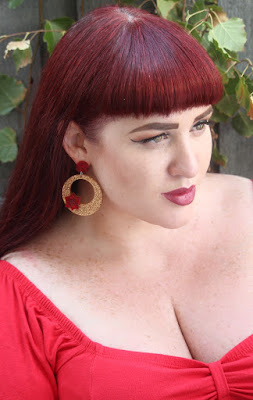 Today Erstwilder releases the stunning flamenco and Spanish Inspired Range! A magical set of truly beautiful designs celebrating the Spanish culture by my amazing friend Donna Luke. 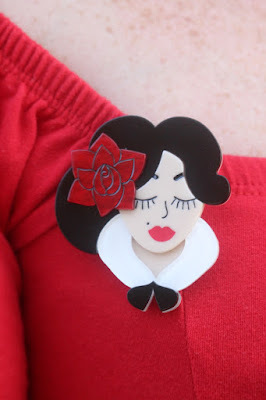 My heart always thumps that little bit harder for a stunning bust style brooch and this lovely lass might just be the most stunning woman in my collection to date. From pinups to cowgirls, zombies to pirates I've got a great set of Erstwilder women and I'm forever looking for more. From the stunningly bold red rose and luscious locks to those absolutely divine lashes this piece is so soft, stunning and beautiful. 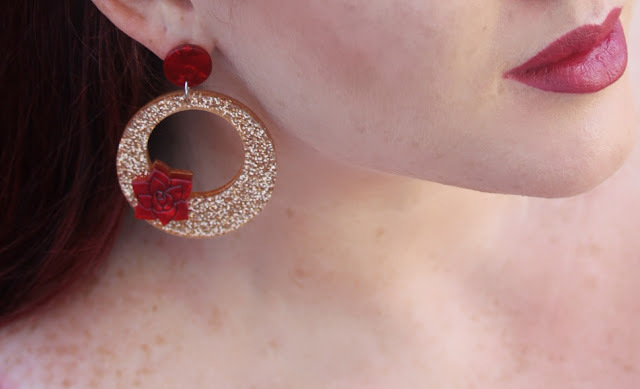 ﻿ You will see a very distinct rose focus in each piece I've photographed and what blows me away is the use of resins and design features to make each piece really pop. The line work on that red rose makes it look exactly like any of my rose accessories. The design of this hand is so stunning that I wish for it to be reality! 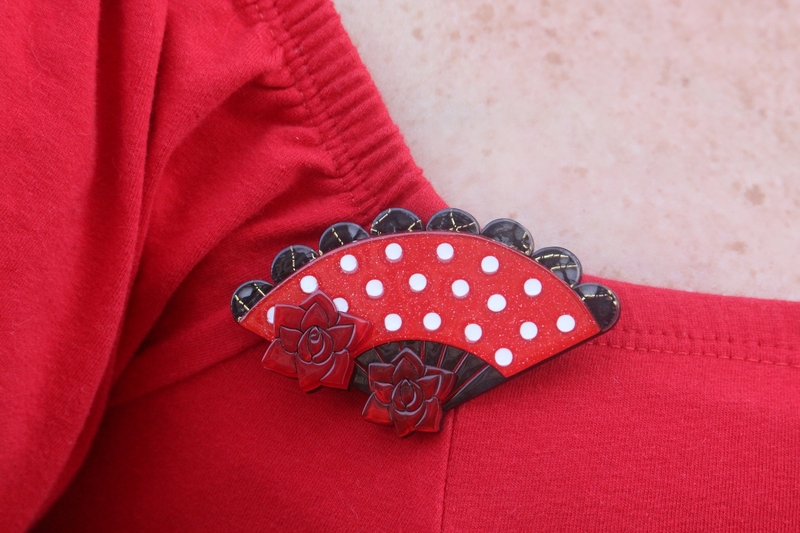 The bold black structure, polka dot 'fabric' and more amazing red roses really make this piece pop. The black resin mixed with gold also creates a magical black lace effect. Now I could not shoot this amazing piece without including one of my perfectly designed Fancy Fans. 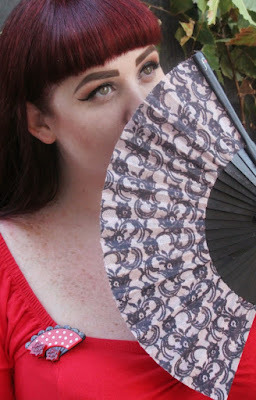 These boldly printed and failsafe fans will keep you cool all summer and looking absolutely fab! Each piece shown in this review includes a rich red rose and I really do adore how they have placed these design so effortlessly into each brooch and accessory. 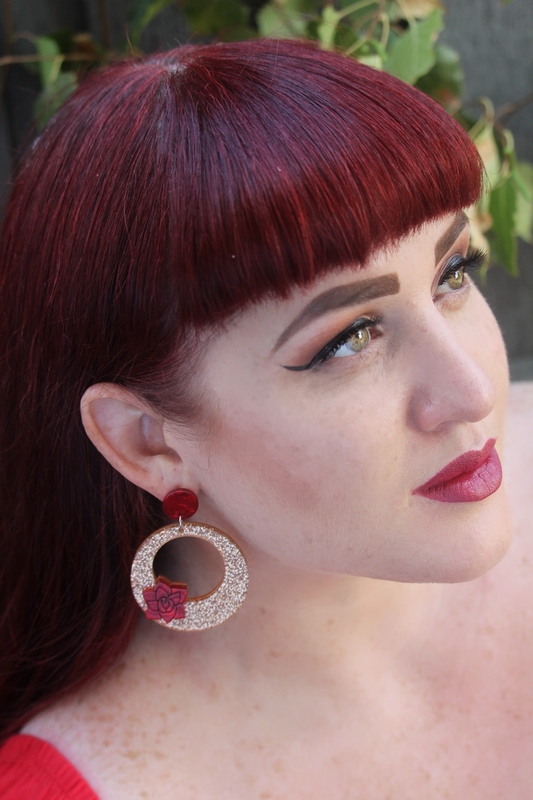 For these stunning earrings the rose has been paired with a sparkling gold hoop and matching red resin top. The glitter used in these sparkles so strongly and brightly you'll be mesmerized every time you see your own reflection.